Obviously, it is regarded as core business by the Coalition. Labor, after it received a battering over its temporary ban on the trade to Indonesia – when Four Corners in 2011 aired shocking footage of cruelty to Australian cattle slaughtered in that country – would not contemplate scrapping the trade. So it has to be a matter of second best options. Agriculture Minister Joe Ludwig insists the provisions that he and the industry have put in mean that there is these days a quick reaction to and action on complaints. He says he takes very seriously the evidence from Egypt, accepting that the cattle were almost certainly Australian. No Australian beasts have been sent there recently, after Egypt objected to the use of growth hormones, but several thousand are still in the country from earlier exports. Egypt has form. The Coalition government suspended the trade there in 2006 because of cruelty. This time the industry has announced a voluntary suspension, with the CEO of the Australian Livestock Exporters' Council Alison Penfold describing herself as “distraught” after seeing the vision. Since February 2010, more than 100,000 cattle have been exported to Egypt. Ludwig says he is willing to put in more regulation for the Egyptian market if that is necessary. “We’ll work with the Egyptian authorities”, he says. Already the Australian ambassador to Egypt has been put on the case, and the Egyptian ambassador in Canberra has been contacted. One disturbing aspect of the live export trade is that those who discover breaches don’t seem to be Australian officials or the Australian industry but animal welfare activists, notably Animals Australia. “There isn’t a regulator standing there at the slaughter every day”, Ludwig says. “These things do happen. It’s like going through red lights. The police aren’t there every time.” And he points to some recent examples of cruelty in Australia that the authorities hadn’t picked up. But it is hard to avoid the conclusion that more should be done. One apparently worthy proposal is for an independent Office of Animal Welfare. This was endorsed by the ALP national conference in 2011, and developed by the caucus working party that had been set up in the wake of the Indonesian atrocities. Federal MP Melissa Parke, one of the caucus activists on the live export issue, outlined to parliament in February how such an office would work. (Parke and Kelvin Thomson, another leading voice on animal welfare, have been muzzled by their appointments this year as parliamentary secretaries). The office would “take the lead role in managing the development of national animal welfare policy”, she said. This would include standards and guidelines, and facilitating co-ordination between the states, which have responsibility for animal welfare legislation. 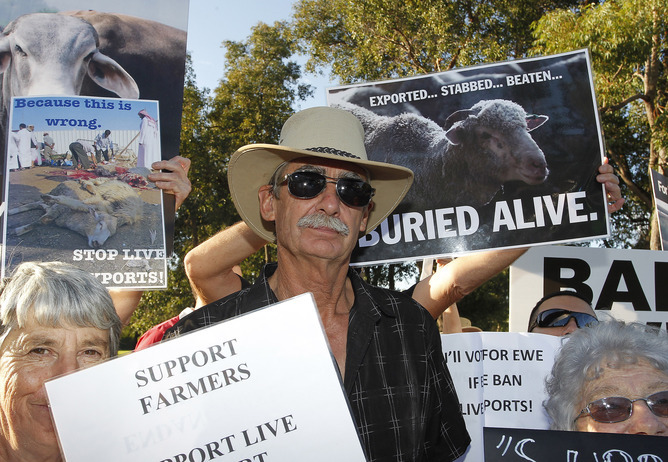 “It would oversee the live export system since this is a specific responsibility of the Commonwealth,” Parke said. Ludwig supported the resolution at the ALP conference and is considering the caucus group’s report. His office says raises a number of significant policy and legal questions. One would think they could be dealt with – if there was the will to do so. As Parke said back in February, such a reform would be welcomed by the Australian community. Anyone who doubts that should remember the public outrage at the original Four Corners footage.